Hi, I'm Emily. I was born and raised in Grantham, New Hampshire. I grew up barefoot in the vegetable garden and running wild in the woods behind my house. I moved to Minnesota for college and got a liberal arts degree at Macalester College. I helped found Stone's Throw Urban Farm soon after graduating and spent three years helping grow that business before starting Whetstone. I put most of my energy in life toward creation- growing food, cooking big meals, knitting-spinning-dying, all manner of working with her hands, and being a momma. I love the way farming makes you feel rich even when your pockets are filled with dirt instead of money. And I'm Klaus. I grew up in the heart of South Minneapolis, on 17th Avenue. I spent my childhood tagging along on my dad’s handyman jobs, conducting scientific experiments, and digging holes in the backyard. I spent most of my adult life repairing houses, fences, sheds, and just about anything else that needs fixing. 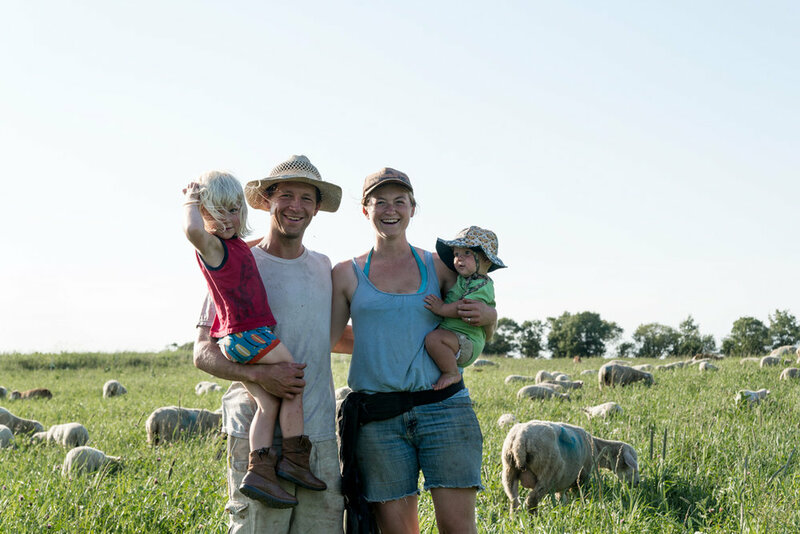 Upon meeting Emily and the rest of the Stone's Throw crew in 2011, I decided to direct my life more toward self sufficiency and being outside: farming! I spent time working and living on farms in Decorah, Iowa in 2012, and then became a Stone's Throw partner for the 2013 season, before forming Whetstone Farm. When I'm not working, I like to bang on the drums and experiment with fermentation. Sylvan was born in August of 2014, and has been a big part of life on the farm from day one. He can usually be found climbing on anything and everything possible, or playing with trains and construction vehicles. Aldo joined us in November 2017, and is bringing a lot of sweetness to our little family these days. Our family is much more than just the four of us! Our house is always open to friends, family, and passers-by. Our community shares in our joys as well as our struggles and makes it all worth it. Please, never hesitate to stop by and say hello, stay for a meal, chat awhile!